Being a film adaption of US Navy SEAL sniper Chris Kyle’s memoirs detailing his four tours in the Middle East, this is a historical account (with obvious elements added or manipulated to better suit the visual medium) of the deadliest marksman in US military history with 255 kills, 160 of which were confirmed by the Pentagon. Add this to the fact that good ol’ Clint Eastwood is the director, one of America’s cultural icons and a man not known for subtlety or nuance with his messages, then you can expect to be pummelled with a fistful of Uncle Sam for the duration of the film’s lengthy run time. As someone who finds the Yanks’ chest-beating, fist-pumping patriotism act nauseating at the best of times, being subjected to multiple uses of the ‘I’d happily give my life for the Stars N’ Stripes’ and the ‘greatest country in the world’ shtick (give it a rest, lads) within the first five minutes itself didn’t exactly endear me to the narrative. Still, I was willing to give it a chance. After all, some of the best war films of all time are centred on American military exploits (Saving Private Ryan and Apocalypse Now, for example) and with its recent Oscar nominations (including Best Picture), I figured American Sniper would come good. Yet, it never really did. In fact, I became more uncomfortable as the film wore on. As what appeared to be the only Westerner in a full screening, watching the Muslim body count pile up (starting with a child and his mother) and Muslims being ubiquitously referred to as ‘savages’ left me feeling more awkward than I can ever remember while watching a movie. It’s ironic that after campaigning for the relaxation of censorship in this column, and seeing substantial improvements recently to the point where I can’t remember the last time I noticed an obvious cut, I was almost wishing the scissors had been taken to the celluloid to spare me from further embarrassment. For, this is a movie devoid of any anti-war sentiment, which does not ask any questions about the futility of the conflict it depicts and certainly eschews any emotional appeal to the fact that we are all human beings regardless of race or beliefs. This is pure and simply an ‘us versus them’ affair, encouraging blind adoration and glorification of the military on a level that wouldn’t go amiss at a theatre in 1940s Berlin. And, as someone who is on neither the ‘us’ nor ‘them’ side, it’s shameful to see some of the reactions on social media from across the pond, and the wide increase in threats towards Muslims in America. Such contrivances as Kyle seeing the September 11 attacks on the news at home and seconds later being dropped off in Iraq are so incendiary and unnecessary they are borderline criminal. Every Muslim seen in the film is either an enemy, dead, or a punchbag to extract information from, even if they are innocent and caught in the midst of war as much as the soldiers are. Getting away from the negativity for a second, praise must go to Bradley Cooper for his portrayal of Kyle. Considerably bulked up for the role and sporting a mean beard and a very believable Texan drawl, he certainly looks the part and his acting cannot be faulted. He can only go by the subject matter and script he is given, and he does a great job of conveying the ice cold sniper on the battlefield and the gentle family man struggling to adapt to family life with his wife (Sienna Miller) and two kids during his leave period as Post Traumatic Stress Disorder (PTSD) starts to kick in. The film also looks gorgeous too, which is a considerable achievement considering vast chunks of the movie have identikit stone buildings and sand for scenery. One scene depicting a sandstorm interrupting a firefight is particularly impressive and features some striking imagery. 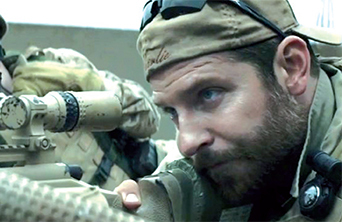 Aside from that though, American Sniper just did not work for me. Perhaps it was due to me not being American and buying into the nationalistic brainwashing, or because of the dreadfully contrived depiction of the Iraq War and Islam as a whole. It was likely a mixture of both, but the jingoistic rhetoric was just too uncomfortable for me. By the way, keep an eye out for the worst, most obvious fake baby you’ll ever see. It’s probably the sole comedic moment in the film, and it’s completely unintentional. With such a huge Hollywood budget, I’m not sure how this oversight was allowed, but it certainly broke the tension.